I need help. I have four gorgeous new prints from Desenio and I can't decide which wall space in my room deserves them the most. I mean... just look at them... they are beautiful - and they feel very grown up which most definitely is a change for me! I'm not sure admitting that I'm a fan of Banky art is the coolest thing because it sort of goes against all his morals and the reasons behind his work but this is the closest I'll ever come to being near one of his pieces of graffiti. I own an end terrace house and always fancied having it decorated in some way - either stealth-Banksy style or maybe like the religious/political images you see on Irish houses? I was delving through the Graphical prints on the Desenio website, looking for a quote poster and stumbled upon the maps. I have a bit of a 'thing' for cartography and fell in love with the unusual way in which this map of the world was designed with the shape of each country being in text. It just draws you in closer, doesn't it? Even before I opened the package my husband said, "I bet there's a picture of London in there somewhere!" He was wrong though. THERE WAS TWO!! These two images are going to look amazing on my office wall, side by side. An iconic London landmark and a line map of the city itself, both in classic black and white. Different, yet complimentary. All the prints are produced b their design team using selected illustrators and artists from around the world. All posters are printed on 200gr uncoated premium paper with a smooth service which is FSC-certified and ageing-resistant. This paper also produces a matte print and gives a high-quality feel to the poster. 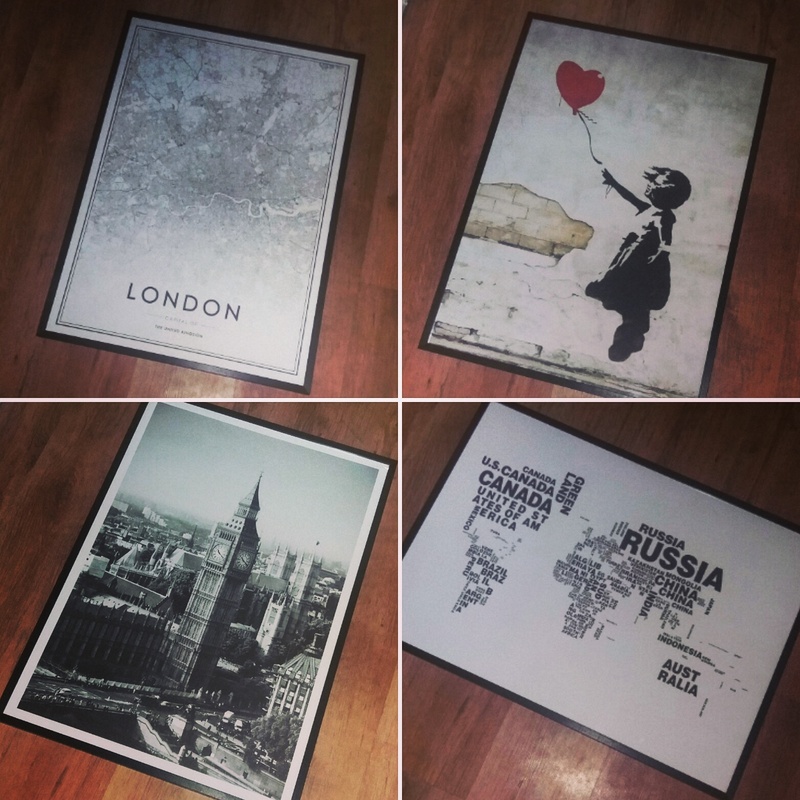 All their prints come with frames (for an additional charge) and are shipped at the same time. My prints were rolled, protected with Desenio printed paper and sent in a hard tube. My frames were well packaged and undamaged upon receipt and came with plexiglass. I chose black wooden frames to keep in with the theme I had in mind but there are many more choices including passe-partout, copper and oak frames. Have a look round the website - there's some fabulous hidden gems in there. I even found a lipstick/perfume/nail polish trio in the section for children's posters which I'm going to put on my own Christmas list!